Ramona Torres, 83, of Orlando, Florida passed away on November 5, 2018. She is preceded in death by her parents, Liborio Alvarez and Celia Rosa, her husband, Epifanio Torres Sr.; her daughters, Miriam Jimenez and Elizabeth Toro; her sons, Edwin Torres and Epifanio Torres Jr.; three of her sisters; and her two brothers. 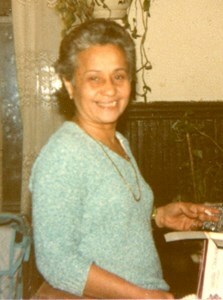 Ramona is survived by her children, Aida (Peter) Vega, Jennie Torres, Sarah Torres, Diana (Javier) Huerta, Rosemary (Bruno) Vega, Julia (Erik) Martinez, Anthony Torres, Harry Torres, and Thomas Torres; her sister, Felicita Medina; her 24 grandchildren, 34 great-grandchildren, and 3 great-great grandchildren. Services will be held at Newcomer Cremations, Funerals, and Receptions located at 895 S. Goldenrod Road on Friday, November 9, 2018 at 10:00am, followed by a graveside service at Chapel Hill Cemetery in Orlando, Florida. Add your memories to the guest book of Ramona Torres.